Leonid Andreyev is a perfect fit for our recent discussions about allegory as well as political conflict and its chilling effect on arts. He began publishing his works in 1898, and soon became politically active around 1905 with the first Russian Revolution. 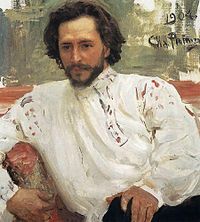 Andreyev’s experiences during this….”eventful”….time in Russia heavily influenced his prose. While his work can be realistic, it has a strong fantastical element that emerges especially in his short stories. His fingers were blue, too, and under his nails, which had grown long in the grave, the blue had turned livid. Here and there on his lips and body, the skin, blistered in the grave, had burst open and left reddish glistening cracks, as if covered with a thin, glassy slime. The problems Lazarus faces are not only from his disturbing appearance. There is something vital missing from his personality. He barely speaks, and when he does, it is almost completely a hollow echo of his interlocutor. Before his death Lazarus had been cheerful and careless, a lover of laughter and harmless jest. . . .the words he spoke occasionally were simple, ordinary and necessary words–words as much devoid of sense and depth as are the sounds with which an animal expresses pain and pleasure, thirst and hunger. For a long while Martha did not want to leave him, for she knew not who would nurse him or take care of him; and she cried and prayed. But one night, when the wind was roaming about the desert, and the rustling cypress trees were bending over the roof, she dressed herself quietly, and quietly went away. Lazarus probably heard how the door was slammed–it had not shut properly and the wind kept knocking it continually against the post–but he did not rise, did not go out, did not try to find out the reason. Aside from the morbid “fun” of poring over Andreyev’s descriptions of Lazarus, I want us all to interrogate this text – what is/are the deeper meaning(s) here? I don’t know enough about Russian Literature to comment intelligently about this story in its cultural context. If you do, if you’re in litLAB or not, please feel free to chime in. What I am going to do instead is to examine Lazarus in light of our recent discussions in litLAB. We have talked extensively about violence and othering at the hands of state or state-scale bodies. What we have not discussed at length is life as “the other”. This term, “the other” is very academic, very abstract. I’d like to embody it in Lazarus himself. Lazarus is as separate from his fellow humans as one can be. But this runs deeper than his appearance or demeanor. Look at how the story begins: directly after Lazarus is revived. We see the fallout from the miracle. We see the difficulties Lazarus has in regaining his physical functions – he never fully regains his personality. The miracle itself was not – Lazarus moves, but is the very spirit of decay. His family abandons him, society avoids him, his house falls apart, his clothes rot off his frame. Eventually, he wanders out into the desert, surrounded only by dead sand and the eternal hot space of the dying sun. Aside from a troubled conversation and torture at the hands of Caesar Augustus, Lazarus never has to deal with any formal state apparatus. All of his interactions are highly symbolic, intensely cerebral (we are treated to the inner monologues of his guests, and extensive descriptions of Lazarus’ effects). We do not read Lazarus’ thoughts. We do not know his inner life, if he has any. Parallels with horror are deep here – I did call him an intelligent zombie. If you want to use horror as a tool to understand this text, I’d recommend comparing Lazarus to the original Haitian lore of zombies: In this reading, a zombie is not so much a resurrected corpse as a laborer exploited so profoundly they are removed from humanity completely, all bonds and possibility of forming/strengthening bonds are removed. The logical outcome of othering, of dehumanization is to not just eliminate what which threatens the regime today; the aim is to eliminate any future that might not revolve around the regime. This is also a tactic of personal abuse. The abuser seeks to control the victim’s present, but also to erase their past and restrict their future. Everything must revolve around the abusive person or regime. Futurity is anathema to a controlling, jealous entity – it distracts from obedience. There is nothing human left in Lazarus. No matter what the original tale says, or what motivations we ascribe to his revival, Lazarus is robbed of something vital by a higher power – he is a victim of a cruel trick, rather than a fortunate man given a second chance. This power enacts a massive change on his life (or death) and does not stick around to help him adjust after. Andreyev doesn’t even let the reader consider what Christ’s “followup” might have been – the story begins and ends with alienation and death. And in the evening, when the sun, swollen crimson and growing larger, bent its way toward the west, blind Lazarus slowly groped after it. He stumbled against stones and fell; corpulent and feeble, he rose heavily and walked on; and against the red curtain of sunset his dark form and outstretched arms gave him the semblance of a cross. Lazarus, now a part of the after-life abyss, fundamentally other from the rest of his cohort, strives to rejoin that abyss. He does this by wandering in the desert, staring into the sun for hours, even after he is blinded by Augustus. His words, even, are hollow and echoing, with no vitality or coherence: When Caesar asks who he is, he responds “I was dead”. Lazarus’ effects on the living are like the Ancient Mariner’s – he interrupts their bright and optimistic existence, offering a glimpse of the chasm of eternity waiting all human beings and endeavors. He is a shard of the abyss, stabbing the comfortable and active deep in their spirits, reminding them of the inevitable horrors that wait.